* Dit is het aanbod van Arboretum Elemental uit Guilds of Ravnica. Als een kaart in meerdere series zit kun je die apart aanklikken hierboven. Klik op de getallen om direct naar iemands collectie te gaan. De leden die het meest recent zijn ingelogd staan bovenaan. Leden die meer dan 14 dagen niet zijn ingelogd worden niet vermeld. You can tap an untapped creature you haven’t controlled continuously since the beginning of your most recent turn to convoke a spell. Convoke doesn’t change a spell’s mana cost or converted mana cost. When calculating a spell’s total cost, include any alternative costs, additional costs, or anything else that increases or reduces the cost to cast the spell. 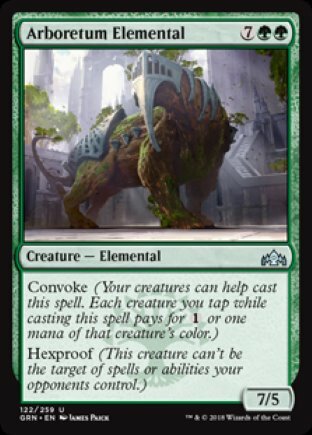 Convoke applies after the total cost is calculated. Because convoke isn’t an alternative cost, it can be used in conjunction with alternative costs. Tapping a multicolored creature using convoke will pay for 1 or one mana of your choice of any of that creature’s colors. When using convoke to cast a spell with X in its mana cost, first choose the value for X. That choice, plus any cost increases or decreases, will determine the spell’s total cost. Then you can tap creatures you control to help pay that cost. For example, if you cast Worldsoul Colossus (a spell with convoke and mana cost XGW) and choose X to be 3, the total cost is 3GW. If you tap two green creatures and two white creatures, you’ll have to pay 1. If a creature you control has a mana ability with T in the cost, activating that ability while casting a spell with convoke will result in the creature being tapped before you pay the spell’s costs. You won’t be able to tap it again for convoke. Similarly, if you sacrifice a creature to activate a mana ability while casting a spell with convoke, that creature won’t be on the battlefield when you pay the spell’s costs, so you won’t be able to tap it for convoke. We hebben alle decks op de site voor je doorzocht en gekeken welke 20 kaarten het meest met Arboretum Elemental samen worden gespeeld.